Victoria Morgan, historical romance author extraordinaire, talented artist, and fellow Quirky Lady member, has a second review for us this week. Thanks, Vicki! It's Love Walked In by Marisa de los Santos. Thanks again to Vicki for entertaining us this week while I lounge on the beach! 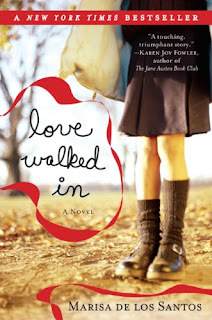 Another favorite romance of mine is Marisa de los Santos' Love Walked In. Set in Philadelphia, Cornelia Brown is young, hip and fun. A romantic, she's a fan of the old black and white movies such as The Philadelphia Story in which Cary Grant is her ideal man. The manager of a coffee shop, Cornelia's life changes one ordinary day when a man walks into her cafe. He's backlit by the autumnal late-morning sun as in a real Orson Welles shot. So begins Cornelia's relationship with Martin Grace, a Cary Grant charmer with whom Cornelia believes she in love. It is not until after Martin surprises Cornelia with an introduction to his 11 year old daughter, Clare, that Cornelia learns what true love really is. Clare has been abandoned by her mother, a party planner suffering a mental breakdown. Brave and heart-wrenchingly courageous, Clare struggles to survive on her own before seeking her father's help. In a blind panic, Martin then turns to Cornelia. Toss Cornelia's gorgeous childhood friend, Teo, into the mix, and you have the ingredients for a delightful story rich in emotions that have you both laughing and crying. The book is told in alternate chapters between Cornelia in first person and Clare in third person. Clare and Cornelia's characters complement each other, strengthening one another as they open their hearts to each other and to love. The author is an award-winning poet, and you can hear her gift as she writes with a lyrical prose. The characters spring from the page, the dialogue is full of humorous banter, and the story is about the courage and bravery in dealing with life when it takes a detour and spins out of control. Love Walked In is indeed a love story, but it's about finding love in many different situations and relationships. It's a remarkable story, and I give it a solid A. This book has a sequel, Belong to Me, but it didn't resonate with me as strongly as this edition. But that's for another blog. Oh, and if Hollywood doesn't trash this script up, the movie rights have been purchased by Paramount and Sara Jessica Parker is slated to star in and co-produce the film. As Penelope would say, let's lift our mango martinis in a toast to the hope that Hollywood doesn't muck this one up! Thanks, Vicki for this awesome review. Do you realize both books you reviewed this week have characters named Clare? Hmmm....very interesting. Also, I cannot stand Sara Jessica Parker. Oy. The Hollywood-ization of our favorite books is not going well. Sounds like a good blog post! I'm off to get my mango martini and hopefully watch a beautiful sunset over the Narragansett Bay. Ciao! I read this novel in June and loved it. It's on my favorite reads of 2009 list. Great review! I have the sequel but want to wait a bit to read it. What a great idea to have a 'best reads of the year list'. I might have to copy that idea, and this book would definitely top my list. The sequel got mixed reviews. It isn't bad, but I just so loved this one so it was tough to compare. RELEASE DATE FOR SWEET INSPIRATION...WOO HOO!